Khandelwal joined freemasonry in August 1984 in Lodge Gondwana No. 226, Nagpur and has been a continuous member since last 34 years. He is also a member of Lodge Trimurty No. 294 and Lodge Vivekananda No. 367, both of Nagpur. All the lodges meet at the freemason’s Hall, Civil Lines, Nagpur. He became an Active Officer of the Regional Grand Lodge of Western India in 1991 and in 1996 he became a Grand Lodge Officer. 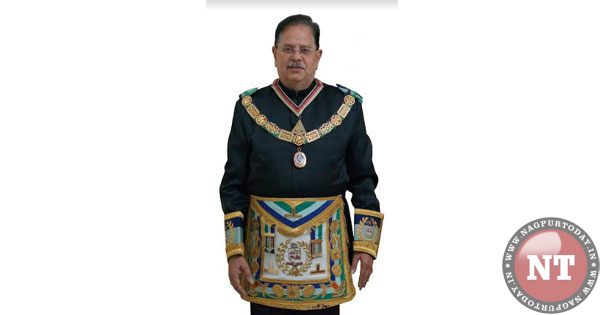 In 2009 he was appointed the Regional Grand Master of Western India, having Masonic jurisdiction over Maharashtra, Madhya Pradesh, Gujarat and Chhatisgarh. He had a very successful tenure and brought up the Region to its pristine glory. He was adjudged one the best Regional Grand Masters of his time and for his efforts and achievements, he was awarded the highest possible award Medal in Freemasonry known as the Order of Service to Masonry. Since the inception of the Grand Lodge of India, less than 100 Masons have been awarded this medal. He got elected to the Grand Board of General purposes in 2005 and is continuously serving on the Grand Board since that year without any break. He was appointed the Chairman of the Finance Committee of the Grand Lodge three times and also member of its Constitution Committee as well as Procedure and protocol Committee. He was also awarded the Yograj Guruwara Trophy for being the Outstanding Mason of the Western Region. Now he will be installed as the Grand Master of the Grand Lodge of India. This is a singular achievement for a citizen of Nagpur. Among others, Khandelwal was also on the forefront to dispel the myth that Freemasonry is a secret society. Under his leadership, several mega charitable projects were undertaken by the Masonic fraternity in Maharashtra, Gujarat, Madhya Pradesh and Chhattisgarh. Khandelwal is also associated with Lions Club and had served as Region Chairman of Lions District 323-H.
Freemasonry has been in existence in the present form for nearly 280 years in the world and for over 250 years in India. It is one of the world’s oldest secular fraternal societies. It is a world-wide organisation based on the principle of the Fatherhood of God and the Brotherhood of man. It is a society of men concerned with moral and spiritual values. Freemasonry is not a religion, nor is it a substitute for religion.It is based on three great principles of Brotherly Love. Every Freemason shows tolerance and respect for opinions of others and behave with kindness and understanding to his fellow creatures. Members are taught to practice charity, and to care, not only for their own, but also for the community as a whole, both by charitable giving, and by voluntary efforts and works as individuals. Freemasons strive for truth, requiring high moral standards and aiming to achieve them in their own lives. There are more than 150 Grand Lodges functioning all over the world. Khandelwal will head the GLI which was consecrated as a Sovereign Grand Lodge with full Masonic jurisdiction over the territories of Republic of India in November 1961. As of now, there are 380 Masonic Lodges and over 200 other Masonic bodies located in different parts of the country under GLI with a total membership of about 22,000 Freemasons.